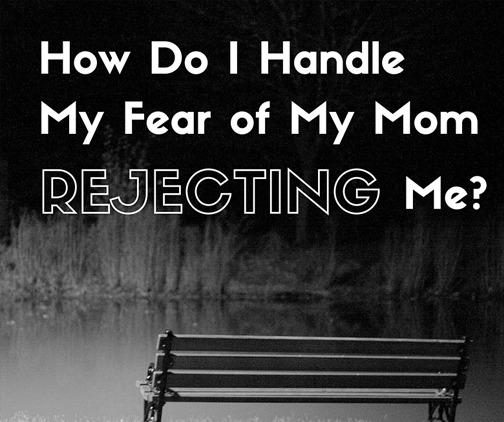 How Do I Handle My Fear of My Mom Rejecting Me? I just had shoulder surgery. It requires 4 weeks of recovery in a sling and physical therapy. I had no idea how I would continue my role as a stay-at-home mom of four young children as I recovered, but I knew there was no way I was going to ask my mom for help. My sweet husband took 3 days off work to take over for me at home immediately following my surgery while I enjoyed laying in bed, loopy on Percoset, reading and sleeping the hours away as if on a much needed vacation. But he’s the only one earning a paycheck in our family and needed to be at work after those initial days. Friends and acquaintances rallied around us, creating a schedule of meals to be dropped off every few days and offering rides for our kids to their various activities. I felt so blessed, so loved. Still, I missed my mom. Don’t we all crave our mom when we are hurting? But I’ve learned not to ask my mom for help at times like these. I used to wait until I was overwhelmed and desperate, and then I’d call and ask if there was any way she just might happen to have a little time to spare. In my mind, I repeated the answer I expected her to give (no no no no no no no no no no no…), all the while groveling out my request for help. It is so hard for me to ask my mom for help because I am afraid of her rejection. Unfortunately, I have learned that I can bear it when she tells me no at a time I really need her. I could bear it when she told me that she couldn’t come to stay with me, our two young daughters and our newborn preemie baby boy when I broke my toe and had to stay on a chair with my foot elevated for 3 days and my husband’s boss demanded he return to the office. I could bear to know that it was her dog that made her unable to come and be with me. But even though I can bear the rejection, I’ve learned that I just don’t want to. From past experience, I know the rejection leads to depression which leads to anger. In the end, it’s my husband and children who suffer with my irritability as my resentment toward my mom continues to build. This is a cycle I don’t want to continue. The day before my surgery, my mom told me that she and my dad were going to be an hour from our home during my first week of recovery. They were taking a little trip to casinos in a neighboring city and were thinking that, on the way back home, they’d stop at our house for a day. “I could get you caught up on the laundry, do whatever you need at the house.” I was filled with gratitude. I hadn’t asked her for help, but she chose to offer it anyway. When I got her voicemail message telling me that it was supposed to snow and rain on the day they’d be driving the 4 hours home, I knew that the visit to our house would get cut. Even though I understood their need to be safe driving home, the same old emotions popped out and sucker punched me: she rejected me again. I don’t like being rejected by my mom, and I try to prevent the opportunities when this can happen. Sometimes, though, there’s nothing I can do. I can’t stop her from rejecting me any more than I can stop myself from craving a deeper relationship with her. I keep trying to find a balance of being with her and being satisfied with what little she can give. It’s difficult for me. Maybe it is difficult for her, too.